Amish made solid oak rocking saddle stool - by itself. Ok, ok... We all know how those parents like to show off their kids, but you’re here to see the stool, right? OK, so here is just the stool, in all its glory. You can clearly see the saddle horn in the front. 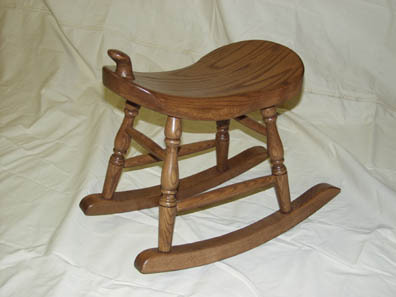 Like our regular saddle stool with horn, the horn is securely glued and screwed to the main seat, but this one is unique in that the Amish folks have added a rocking chair style base. Is this a quality product? Well, it’s been load tested to 345 pounds by the webmaster, so you make your own decision! Made of solid oak, your stool can be stained in a variety of finishes to match your decor, or, have yours unfinished and put the finishing touches on it yourself.